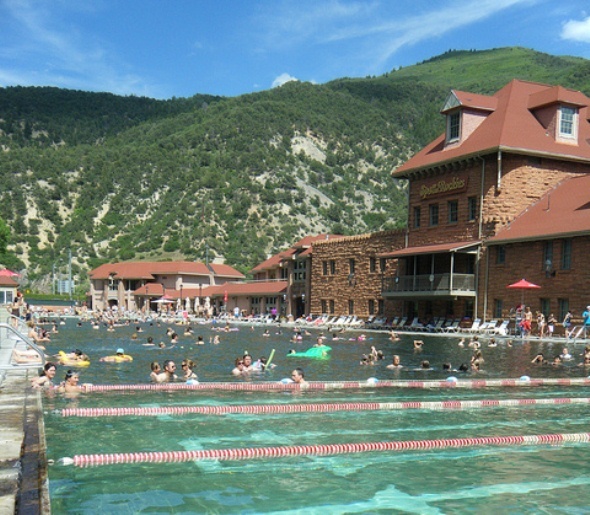 The Glenwood Hot Springs Pool has been in operation since 1888, using 3.5 million gallons of naturally hot mineral water that rises from the Yampah Hot Springs each day. The main pool is kept at 90 to 93 degrees, while the therapy pool is at 104 degrees. The outdoor pool is two city blocks long (405 feet by 100 feet, with nearly 1.1 million gallons of water), and it has been the world’s largest hot springs pool since it opened. The pool is open year-round, and clouds of steam rising from the pool during the winter are visible from Interstate 70, which runs nearby. The therapy pool is 100 feet by 40 feet. The hot springs naturally contains 15 minerals, led by sodium chloride, potassium sulfate, calcium sulfate and calcium bicarbonate. The pool adds fresh water to cool the water from the 122 degrees at the spring and adds chlorine to meet state standards. The pool was built by silver baron and banker Walter Devereaux and his brothers and originally measured 615 feet by 75 feet, with a fountain in the deep end. A four-story bathhouse and lodge was added in 1890, built at a cost of $100,000 using pinkish peachblow sandstone from nearby quarries and featuring tubs, Roman vapor baths, a ladies parlor, a physician’s office, a gymnasium, and smoking and reading rooms. Each of the building’s 44 bathing rooms included a dressing room and lounge. During World War II, the pool, the bathhouse and lodge, and the nearby Hotel Colorado were used as a U.S. Navy hospital. Today, the bathhouse and lodge building houses the Spa of the Rockies, with eight treatment rooms and a specialized hydrotherapy room, and there is a 107-room Hot Springs Lodge that opened in 1986 just north of the pool.